The charming village of Skagen in North Jutland, known as "the Land of Light", sits neatly on a ragged finger of Denmark, which points rather accusingly towards Sweden. It might be a place synonymous with the elegant, Danish-designed watches but as we discover on our cycle tour, taken in the Danish tradition at a cracking pace, there's more to Skagen than naming rights to those sleek timepieces. This northernmost tip of Denmark and mainland Europe has produced a sand-and-moorland landscape of luminous light. This light turns an enchanted azure when sea and sky merge in the twilight to create a natural phenomenon called Blue September, celebrated with a dedicated festival. Skagen is where two bodies of water violently meet. Skagerrak is an extension of the North Sea, and Kattegat, the strait between Sweden and Denmark, is an extension of the western Baltic. The turbulent clash of waters results in an abundance of fish but also produces fierce currents, generating a graveyard for shipwrecks. 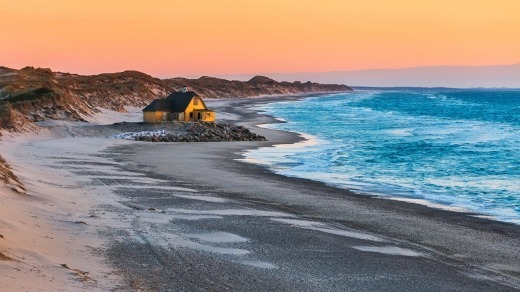 Swimming is forbidden off Grenen at Skagen's tip, though visitors can place one foot in Skagerrak and another in the Kattegat – literally spanning the seas in one stride. Grenen, one of our cycle highlights, is a spur of beach that is gradually extending beyond the dunes as tides throw up more sand to nourish it. Some say that in time, Denmark and Sweden will have a new land bridge to rival the Oresund crossing. Skagen, whose name means narrow promontory, is a shape-shifting place. Though it has been around for 700 years, there's a magical quality to this environment, which nature constantly and jealously tries to claim back. Just southwest of Skagen is Rabjerg Mile, which threatens to swallow everything in its relentless path despite forestation efforts. Northern Europe's largest moving dune, which formed in the 16th century during the great sand migration, creeps at about 15 metres a year northeast from the west coast towards Skagen and Kattegat. The marching dune rears about 40 metres above sea level, spans about two square kilometres and it has teeth – hikers are warned about quicksand, though there are wonderful views from on top. We cycle across sandy paths to Skagen's Buried Church, a dune victim. Only the tower of the 14th-century church remains, once the region's largest church and named for St Laurence, the seafarer's patron saint. It took two centuries for the dune to claim the church in the 18th century – the congregation was forced to dig its way in – and it was finally closed by royal decree in 1795. 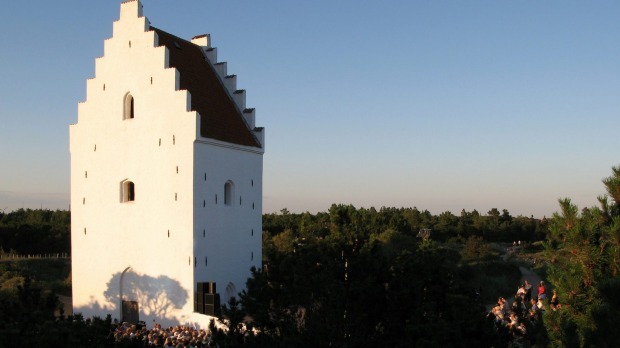 Strange to think the chapel lies beneath our feet but Skagen has put the rather striking tower to good use – it makes a stunning backdrop for cultural events such as the annual World Ballet, with performances from London's Royal Ballet. Culture, in fact, came early to Skagen, despite it being Denmark's main fishing port, beloved of herring, with distinctive colourful warehouses and fishermen's cottages between which we cycle. Skagen's scenery and light attracted artists in the 1870s, known as the Skagen Painters. Often painting en plein air, they emulated the French impressionists. Their style challenged the then rigid traditions of the Scandinavian fine arts academies. The close-knit group gathered regularly at Brondums Hotel. Since those days, the town has exerted a strong magnetism, with its typical yellow-plastered houses with red roofs. Brondums is one of many charming hotels catering to visitors seeking excellent local seafood, artistic ambience, hikes and cycles and that particular Danish quality of hygge – where one slows down and enjoys life's quieter pleasures. Brondums' dining room became the centre of the artists' social life, filled with the paintings they exchanged for board and lodging. In 1908, Skagens Museum was founded in the dining room but is now in the neighbouring building completed in 1928. The Skagen Painters' collection totals about 9000 works. The museum has an English tour that looks at the artists and their paintings, which capture Skagen's idyllic qualities. And as for those Skagen watches? There's a gay abandonment of bicycles when we reach the town, as members of our cycle troupe sprint off to buy a selection. I am more interested in the queues for Danish ice-cream at Iscafeen near the Mindestotten memorial to the eight Skagen fishermen who died in 1862 while trying to rescue the crew of a Swedish ship that ran aground. If Danes are queuing, it must be good. Their smorrebrod gets a rap too. APT's 15-day Majestic Norwegian Fiords small ships expedition cruise from Tromso to Copenhagen starts from $16,895 a person, twin share including $900 a couple air credit. Based on an August 22, 2019 departure. See aptouring.com.au/trips/russiascandinaviabaltics/nobhtc15 or call 1300 196 420.